(you can replace “to be” with an expression of your liking, the results would be the same). If we use the above expression and no other filters, we would see the total population of LinkedIn. The number of LinkedIn members that I see at the time of this post is 563,974,696. This number is approximate, not exact – for large numbers of results, we can expect to see approximate numbers. Interestingly, right now, LinkedIn Recruiter, with the same search, shows 560,454,559 results, a 3 MLN member records fewer than in a personal account. Searching for “to be” OR (NOT “to be”) can be narrowed down to locations and companies and will continue showing all results, the 3rd level and out-of-network included. The number of people who are “open to new opportunities,” visible in Recruiter, is currently 28,285,514. That makes 3.7% of LinkedIn members – almost four times higher than a year or so ago, so setting this status has become more popular. For many more tips on mastering LinkedIn searches, check out the recording of the presentation “Overcoming LinkedIn’s Limitations” in our Training Library. 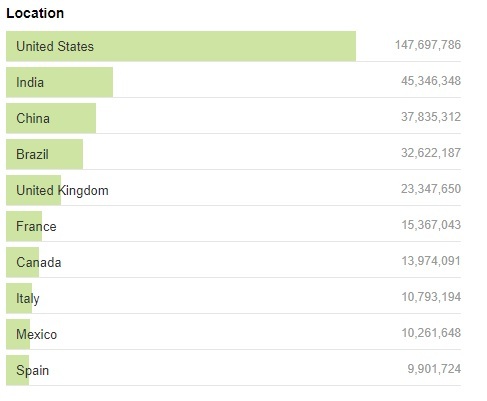 It’s interesting that several among that LI top 10 are not among the 25 largest employers in the US (https://en.wikipedia.org/wiki/List_of_largest_employers_in_the_United_States) nor globally (https://www.statista.com/statistics/264671/top-20-companies-based-on-number-of-employees/). While some of that makes sense (the vast majority of retail firms’ employees do not generally match the profile of typical LI users), it is interesting that other types of large firms with a Western skew (i.e., should be LI’s sweetspot) are not as represented atop LI (e.g., Tata, Deloitte, JP Morgan should’ve ranked higher, and where the heck is Accenture – but perhaps LI is not grouping TCS company employees with Tata; JPMorgan with JP Morgan, JPMC, etc., in your searches?). Thanks for the comment! 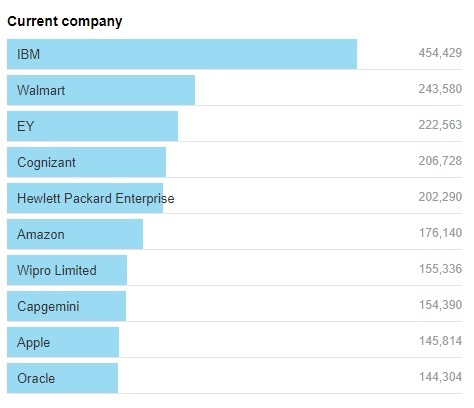 Yes, the same company may be represented by several “companies” on LinkedIn, therefore, providing the numbers that are lower than we would expect. The number of employees of IBM it shows is much larger than the number stated in Wikipedia. See this comment: https://www.linkedin.com/feed/update/urn:li:activity:6392379385223147521. The reasons listed are a) people who leave IBM don’t put an end date on their LinkedIn experience period. b) some claim falsely to work for IBM c) there are fake accounts which claim they work for IBM as it’s reputable brand but hard to verify true status. — Still the discrepancy is high!